Each of us has a daily routine and by now we are pretty good at it. We know the best place to buy fuel for our vehicle, shop for food or buy the household goods or hardware needed for our family’s daily life. In other words, because we have practice at these things we do a pretty good job of making purchases for our day to day items. It’s also true that all these purchases are done in a none stressful, care free environment, no one tries to up-sell you at the grocery store or the gas station. In fact, today we pay at the pump for our fuel and many supermarkets now have self-check-out, therefore we can complete these transactions with no human interaction at all if we wish. Even at the hardware store the clerk is most likely laid back and there to be helpful. However think about our big purchases, cars, trucks, homes, RVs. Notice that as the price tag goes up and the purchase becomes less frequent, the companies who sell these things see to it that human interaction is the main focus of these transactions and rightly so as we often do need help as we are unfamiliar with the product and in many cases the typical means of financing. Thus, the value of sales staff for the customer and business is obvious. Yes, it is possible to buy many of these things without sales folk, but most of us will not, as we value the hand holding a knowledgeable sales staff provides. I still remember the first time I went to make a purchase that I really had no idea how to quantify the value of the item. 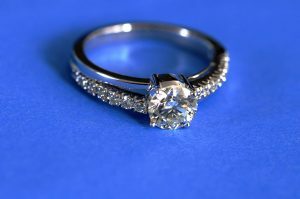 Having grown up in a very conservative no-jewelry household I experienced deep angst upon attempting to buy a diamond engagement ring for my intended bride. I also did not know anyone who could guide me in the process and since it was to be a secret until “the moment” I could not make a lot of inquires. The good news is I did find an acceptable ring, Audrey said yes and that diamond is still part of her jewelry collection, now on a pendent as the diamond ring needed to be upgraded a few years ago. Sales is a component of how I have made my living, clearly teaching the potential customer about a product is the primary purpose of good sales work, but my point is each of us needs to notice the shift as we move to these big purchases and understand our vulnerability. The first key to making good decisions on big purchases is to have firm control of our emotions and as much knowledge of the product we are attempting to purchase a possible. It is also important to recognize that the sales person is worthy of consideration if they helpfully educate you. Of course, as always with me timing is also important. Hopefully you are familiar with the seven segments of time and their distinct characteristics. Our ability to time a purchase is often somewhat limited. We likely don’t have decades to wait, as we have needs, non-the-less I would encourage attention to days, weeks, and months even years if the luxury of a longer time frame is available. Because we know that revealing light is the primary feature of “time segment one” this may be the moment of clarity for that big purchase. Likewise, “time segment two” with its opening of space for new life with chaos above and below may also be a good time to make the purchase. Keep in mind that there will be a good amount of negativity around so you may not feel optimistic, but if you have completed your homework and know the market place from which you are making the purchase these first two segments of time are likely the best in which to make your move. There will be other opportunities but “time segments one” and “two” offer the most flexibility for buying at fair prices and the longest window for financing that bigger purchase. By “time segment three” when new life sprouts for all to see, competition for the item you seek may become a bit stiffer, therefore if you find yourself in “time segment three” it might be a good to wait as a new standard will be set in the “time segment four”. Recall that the time setters of “time segment four” create no new life but they do give direction and have a link to “time segment one” in fact I would suggest “time segment four” may be the last opportunity for a good decision until the cycle of seven rolls over and the light of “time segment one” reappears with one exception. That exception is early in “time segment five”. “Time segment five” will have danger in it, a purchase early in “time segment five” might be a good idea if you know the product well and find that needle in the hay stack deal. Moving quickly will be of paramount importance and it is very important to stay within your means. Otherwise “time segment five” can bite very badly, “time segment six” is clearly not the moment to make a big purchase but be warned that in “time segment six and seven” the optimism of the market place will be very tempting. A sense that everyone is doing it and you missed out will be prevalent. This is the moment for utmost discipline and careful reservation. A rest in “time segment seven” will have the potential buyer best placed when the light reappears in “time segment one”. I hope you find a diamond of a deal and be sure to thank the sales person who walks you through the process and educates you. If what you just read makes no sense to you I suggest you read “Know the Time, Change Your World” and pay special attention to the second part of the book.